I own a 3706 on bracelet which I purchased new in 2001 but it has never been serviced. Worn continuously ever since so it shows its' age and runs as flawlessly as on day one. Due to its age I think that it may require some cleaning and oiling. I am thinking of sending it to IWC but if open to suggestions. If you have any, please let me know. I had one of my Big Pilots serviced earlier this year and the IWC Service Center (which is located in Fort Worth, Texas) did a great job. My watch was not running at all when I sent it in. I requested my service kit on January 19, had the repair estimate from IWC on January 30 and had the watch back on my wrist on February 15. You can go online to IWC.com and request a service kit. IWC will send you a prepaid box/kit to use to ship it on (at their cost) within a few days. You send it in and can track all of the service progress through their website. The alternative is to wait until the watch begins to show evidence of needing a service - and send it in at that time. However, at ~18 years old, you might want to have it checked out - particularly the seals for water resistance. but firstly.i want to Thank Jorge for recommending IWC service center in Texas. after 9 years of wearing enjoyment. it was time to send this BP for service. at first. i was a bit nervous to send it to a place i had no prior experience with. got mine back last week and couldn't be happier. it's very easy to follow their instructions (as Michael explained it), and you'll have it fixed in a timely manner. most importantly is that your watch will be in good hands. i assure you won't be disappointed. I will second the Fort Worth service center and the IWC concierge service. Easy and fast. I had my Mark XVIII in and out within two weeks. Great info, thanks for sharing our experience. I have a 2005 IWC 3706, which I bought pre-owned last year. After several weeks, the chrono did not work. Sent it to IWC for complete overhaul, they charged me USD 700, which include polishing and replacing the barrel, pushers, and crown.got a 2 yera guarantee. Run flawless until now. I recommend to sent it to IWC if you want peace of mind especially the guarantee. 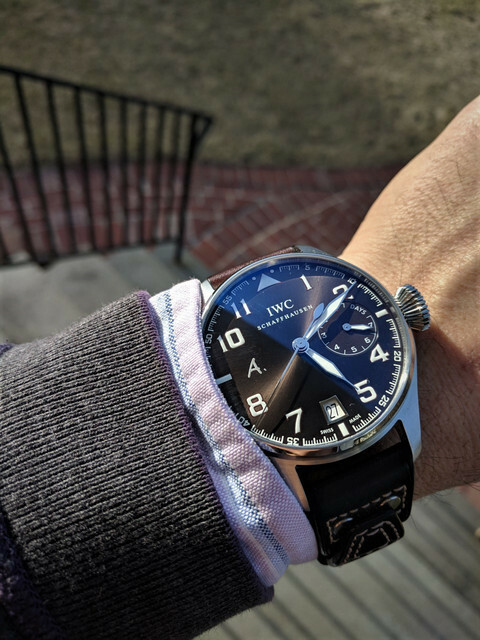 Next Topic: NEWBIE to IWC (and specifically BIG PILOT) some initial thoughts & ideas - pls comment. Thx.